Stay updated on used motor oil & filter recycling information and locations. Click here for a list of used motor oil and filter collection centers. Used motor oil cannot be mixed with any other substance. Oil mixed with water, paint, solvents, rags, and antifreeze is contaminated. Contaminated oil must be taken to the San Mateo County Household Hazardous Waste Facility. Call (650) 363-4718 or visit smchealth.org/hhw to make an appointment. Drop off is free. Collect your used oil in a clean, non-breakable plastic container that has a screw-on cap. 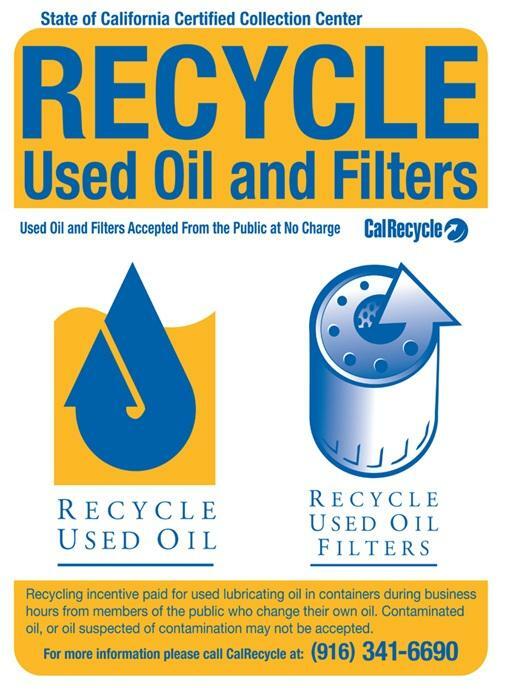 Place used oil filter in a sealed plastic bag or contact us for a free reusable filter recycling container at (650) 372-6252 (while supplies last). Many collection centers also take your used antifreeze, car batteries and tires for free or a small fee. Bay Area boaters can find out how to safely dispose of used motor oil, oil filters, and oil cleanup absorbents using the 2016-2018 San Francisco Bay Area Clean Boating Map. San Mateo County’s recreational boaters have access to free household hazardous waste disposal services. Make an appointment by calling (650) 363-4718 or online. If you are a Monterey County resident, you can find used motor oil and filter recycling information here, and information on household hazardous waste disposal here or by calling 831-755-4505. Check out these helpful videos for tips on proper motor oil management and fuel management. 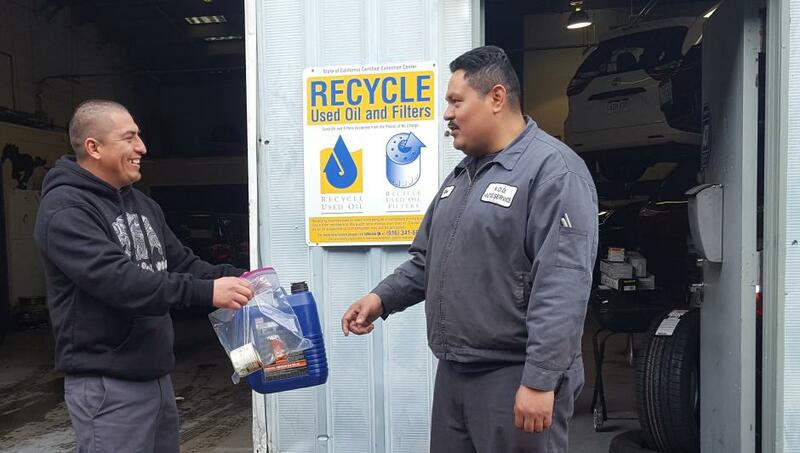 If you own or operate an automotive parts retail shop, service or repair shop, gas station, or auto dealership and are interested in becoming a certified collection center please visit CalRecycle or call (650) 372-6252. Varios locales aceptan el aceite y filtros usados de motor sin costo alguno. Cada local acepta hasta 5 galones. Llame antes de llevarlo para asegurarse que los tanques no esten llenos. Si tiene más de cinco galones u otros productos tóxicos, tales como solventes, pesticidas y herbicidas, productos de limpieza o pintura, también pueden aprovechar del Programa de Recolección de Productos Toxicos del Condado de San Mateo. Llama al (650) 363-4718 para hacer una cita gratis.